I have been following Isabel’s development in my daycare group since she was 1;5 years old. At 2;3 she became my „observation child“ in the IHVO certificate course. Now Isabel is 3;8 years old. The world of numbers continues to be a major issue for her. Now and then she leaves our group and looks around the entire kindergarten – probably also for new playmates. – collects positive experiences in small groups. That’s why I want Isabel to put the small groups together himself. I think she can already judge a little bit with which children she can share similar interests and needs in terms of thinking, researching and shaping. Since Isabel has often refused to participate in small group offers, such as number games, I came to the conclusion that I should try this variant. I’m very curious to see if she’ll get involved. Isabel already has a very well developed social behaviour and I want her to be willing to share her knowledge with other children more often and to experience that she too can learn from other children. Isabel has noticed that she can learn a lot in close contact with her kindergarten teacher (the author). The cognitive input is good in these situations (see the other reports about Isabel) and Isabel loves these times when her teacher supports her in learning. Based on this experience, the kindergarten teacher now builds up and introduces Isabel to playing and learning in a small group that Isabel has not been able to accept so far. The trick is to let the three-year-old girl choose her play partners for the small group again and again. This eventually leads to playing contacts with much older boys. At the moment Isabel prefers to play number games, she has a lot of fun with them and always demands new impulses. I would like to build on this with small group work. In various situations Isabel showed unconventional learning strategies (see: Indicators of Possible Intellectual Giftedness.) I want to find out whether these strategies are coincidence or whether this young girl is already able to invent strategies. In the games I will propose a variation, which we will play first. Then we in the group consider together which variants we can still find. Name and use number words in known contexts in the correct order. Identify and name numbers from 1 to 6. Creation of a numerical book according to Isabel’s ideas. Isabel is allowed to choose a group of children for the first action. I don’t pretend how many kids there are. I would like to observe with what care she selects the children and which children are important for Isabel in this situation. I also thought about giving Isabel the opportunity to choose the children’s group before each activity. Maybe a circle of friends will develop? I will use different rooms: the next room of our group, which is often used for role plays, the music room, the pre-school children’s corner, where the computers are – and if the weather allows it – the outdoor area. I would like to integrate some offers into the everyday life of the group. Since I watch my children closely, especially Isabel, I always find situations in which one can insert game variations. Therefore, it is important to be well prepared and to know which games with the appropriate content children are interested in. The games I have chosen should show the various game possibilities in the field of numbers. Fiona (3; 11), Caspar (4; 3), Valerie (4; 4). Isabel herself is 3;8 years old. We met at 13:00. I have observed again and again that the children come to rest at this time and are busy with different games. All small children sleep then, and the older children are undisturbed. My first step was: „Since you all can count so well and are very busy with numbers, I would like to play a game with you with numbers“. First Valerie called, counting to 19, then Caspar to 17, Isabel to 13 and Fiona to 10, all counting in the right order. With Isabel I could observe that she was very concentrated from the beginning and counted with the other children. She also noticed when a child miscounted and said so. I praised the children for their performance, but I also knew that Valerie and Caspar could count to 20. And as if they could read my mind, they started counting again. They counted to 20 and beyond, but then no longer in the right order; I let them go. Isabel’s reaction: „I want to count again!“ Now she was counting to 20. We were all amazed and praising her. You could tell from her attitude that the praise did her good. She was happy and wanted to count again and again. I said, „Do you have a favorite number?“ All the children gave me a number: Isabel the Four, Laurenz the Five, Fiona the One, Valerie the Four and the One. At that moment I realized that Isabel had already built up an exact idea of numbers and used them flexibly. First I clapped my hands six times. All the children counted correctly and laid six building blocks in front of them. Now I asked the children: „Now it is your turn. Who wants to start clapping?“ They all called. I determined that Isabel begins. She clapped seven times. All the children did everything right. Caspar and Valerie clapped 15 and 13 times respectively; the counting went well, but counting the building blocks caused the children some difficulties. Together we checked the results and corrected them. Isabel, Valerie and Caspar strived to solve their tasks correctly and also helped each other. With Fiona I could observe that she was overburdend; then she had also no more desire and withdrew. The other three children continued to play for some time, for a total of more than 40 minutes. They even looked for other variations: instead of clapping their hands, they used musical instruments such as tonewoods and triangle. Instead of building blocks, they took animals, cars and Lego figures. When the children took the game into their own hands, I withdrew and just watched. I was surprised about Isabel, because she accepted the game well and came up with her own ideas. I had never experienced them so actively in a small group before. Isabel asked the same kids as the first time – except Fiona. When I asked her why she hadn’t asked Fiona, she replied, „Fiona can’t yet.“ She went straight on and wouldn’t discuss it with me. Instead, she invited Marian (3;8), whom she had already experienced in a small group. I got the instruments ready, the children could choose. Isabel and Marian chose tonewoods, Valerie took a triangle and Caspar grabbed a drum. Now the instruments were assigned numbers; just to start, the tonewoods got the 1, the triangle the 2 and the drum the 3. The rule is that children play on their instrument when their number is called. To do this, the children must be very attentive and focused. At first I called the numbers slowly and with a large time interval, then faster and faster. The children had a lot of fun. Isabel was very concentrated, as I could tell from her big eyes and her clenched mouth. Then I varied the tempo, a beautiful melody was created, and the children were amazed at the result. Isabel always kept an overview and was even able to give a sign to the other children if they did not immediately start playing with their instruments. Finally, the children changed instruments and larger numbers were distributed. Isabel wanted to take on my role and call the numbers. She did very well. She was able to remember the numbers of the instruments and, if necessary, draw the children’s attention to their use. (Here I discover as indications of a possible giftedness: good observational ability, early urge for self-control and self-determination. Isabel expects her judgment to be recognized when she feels she has an overview of a situation. 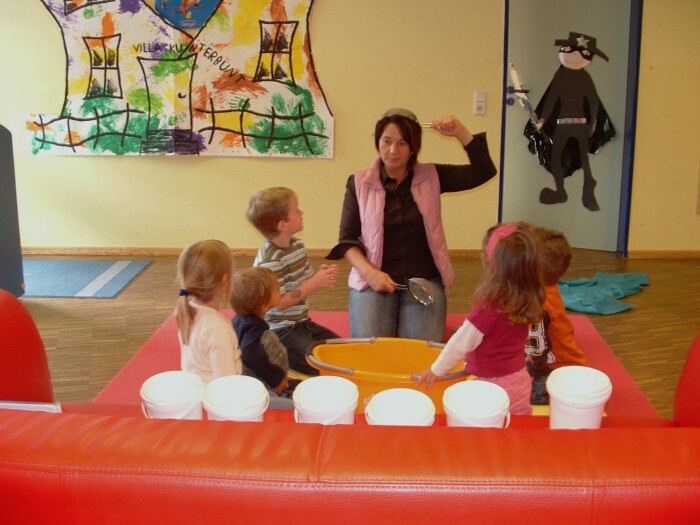 With this game variant, all children were able to experience that numbers and music can also form a unit, that something wonderful can be created, which can be individually modified again and again. Isabel was also able to gain experience in this small group: The circle of friends produces a lot of humor and enterprise. This was an offer to the entire kindergarten group. It took place in the music room where our Punch and Judy theatre is located. Seppel needs help, because his best friend, Kasper (Punch), still has difficulties counting. Seppel explains that Kasper can actually count to 15, but does not always know the correct order or omits numbers. Seppel asks the children to help the punch. All the children agreed, because the children love Punch. Before Punch appeared, Seppel wanted to know from the children who could count to 15. Valerie (4;4) and Caspar (4;3) answered immediately and correctly counted to 15. Also our two preschool children (our group is mixed age from 1 to 10 years) took part. Isabel was also asked if she could count. She didn’t say a word, remained silent. Her behaviour (refusal to reveal their knowledge to the whole group) did not change in the current game. But I could see that she was following the whole process closely. When Punch appeared and kept forgetting numbers, Isabel showed no cooperation to help Punch. All other children, including the older ones, were very active in counting in the correct order. When I asked Isabel why she didn’t help Punch, she said she didn’t feel like it. My guess is: Since Isabel can now count to 15 for sure, this game variant was no real challenge for her. She was capable of it and she withdrew. Maybe she didn’t see the point of this game either – maybe she thought about what sense it makes to help a doll count… Especially gifted children are sometimes very critical about those situations and don’t feel taken seriously by „baby easy“ games and wonder why the other children enjoy it so much. Together with some children of the group I had made a number cube. Both of our pre-school children were involved, since for them numbers are just very topical. Isabel showed great interest in the cube. When I asked her if we wanted to play a game of dice with some children, she agreed. She chose the small group again: Valerie, Caspar, Malte (5;1), Denis (5;3). First we looked at the numbers on the cube in order. I wanted to find out which Isabel recognizes and which she has difficulties with. It turned out she couldn’t see only the 5 and the 6. The rule of the game was to add or remove objects according to the number rolled. The children let their imagination run wild and used all suitable objects that they could find in the group (building blocks, cushions, plates, cars, etc.). The more often Isabel played the game, the more reliably she recognized the numbers. But she only ever wanted to play with the children who were there the first time. This dice game also aroused the interest of other children in the group. They became curious and wanted to participate in the fun of others. The children and I made a second dice with points for the younger ones. So everyone was satisfied and enjoyed throwing dice. In the following game it became clear that Isabel recognized the numbers 1 to 6 more and more reliably. For the game we filled sand into a plastic tub and distributed wooden figures from 1 to 6. 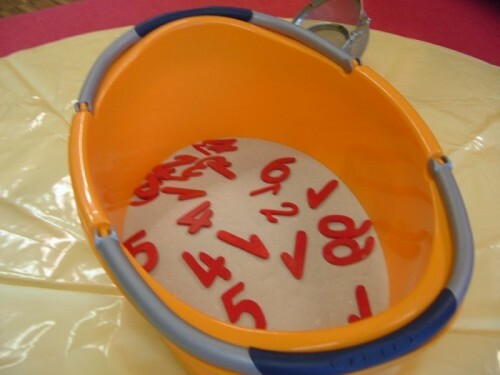 The children should catch the numbers with small sieves and then sort them into the correspondingly numbered buckets. When I introduced the new game, the same players came together as when we played dice. Has a circle of friends developed yet? All children in this small group are self-confident, assertive, cooperative and creative. Above all, I was pleased that Isabel felt comfortable in this group. She is not bored and can face new challenges. Isabel and the other children showed great interest in this game. Everyone was curious to see which number was fished. And it was checked exactly whether it was sorted into the right bucket. Isabel showed great tension – she always wanted to assign and name the numbers correctly. She developed her own strategy: for example, if she had caught a 6 and could not name it immediately, she compared the number with the numbers on the buckets, counted the buckets quietly, and then she could name the number. She was always successful and was praised. In this game, I was just an observer. I found it fascinating that the children could play the game alone for about half an hour without arguing or cheating. Isabel was now increasingly interested in computers. I offered her that if she wanted, we could search and type the numbers on the computer keyboard. Isabel was pleased with the offer and wanted to try it out right away. She found it very exciting and tried anything. Since the numbers on the keyboard are quite small, it took Isabel a while to find the 3. But it worked. After that, Isabel didn’t miss any opportunity to come to the computer with me. She has found a new challenge. According to my original plan, I wanted Isabel to create a numbers book from her own ideas. But she showed no interest in it at that time – and so I let it remain for the time being. If she will be interested in it later, I’ll take it up again. I have achieved my goal: Isabel can now count to 15 in the correct order and recognize and name the numbers 1 to 6. She has practiced this in the various games. She no longer omits numbers and does not swap them. The games were varied. For Isabel it was important that she could incorporate her own ideas. So the game remained interesting, boredom did not arise. This was also an important experience for me, because Isabel often interrupted offers or withdrew because she was supposed to obey my rules. Now she was a co-creator of these games, and that’s what Isabel needs and wants. My greatest success was that Isabel was always active in the small group. She didn’t retreat, but always was happy to join in. She also had no inhibitions about expressing her ideas. This was because she was able to choose the participants of the small group herself. From the very beginning, she has selected the children in a targeted manner, otherwise such a fixed group would not have been formed. I could observe that Isabel felt comfortable and had fun in it. A good experience for Isabel (3;8) was also that the two preschool children Malte (5;1) and Denis (5;3) joined the group. Before, the two boys had not shown much interest in doing anything together with Isabel. For Isabel, the participation of the two was a confirmation that her knowledge also finds recognition among older children. This strengthens her self-confidence. I hope and wish that the small circle of friends that has developed will continue to strengthen. I will definitely support this. I had not expected Isabel’s great interest in computers. But Isabel always amazes me. I’ll give her a chance to work with me on the computer. Our preschool children can acquire a „computer driving licence“ from us. This enables them to work independently on the computer. Maybe Isabel can be given the opportunity to get her „computer driving licence“ much earlier. For the computer driving licence, see also the article: Making Use of the Computer and the Internet. In the course of the learning processes described here, I was able to observe how Isabel’s personality developed further. I find it remarkable that she is always able to find her own learning strategies in order to achieve the result. Dieser Eintrag wurde veröffentlicht in 4.1 Basics of Advancement von hanna. Permanenter Link des Eintrags.